The most influential maritime event of the year was held from December 1 to December 4, 2015 in Shanghai New International Expo Center: the 18th Marintec China. Nanjing High Accurate Marine Equipment Co., Ltd., a subsidiary of NGC Marine Group, participated in the expo with General Manager Chen Yongdao leading the sales and technical teams to communicate and negotiate with global customers and partners. Marintec China is esteemed as the ��1st Exhibition in Asia and 2nd Globally�� in terms of marine affairs, and is held by the Ministry of Industry and Information Technology of the People��s Republic of China, the Ministry of Transport of the People��s Republic of China and Shanghai Municipal People's Government biennially. The ground area of this marine affairs exhibition was over 70,000m2, with the event itself attracting over 2,000 enterprises from 34 countries and regions, such as Germany, Norway, Japan, South Korea and China. Professional audiences numbered over 60,000 attendees. 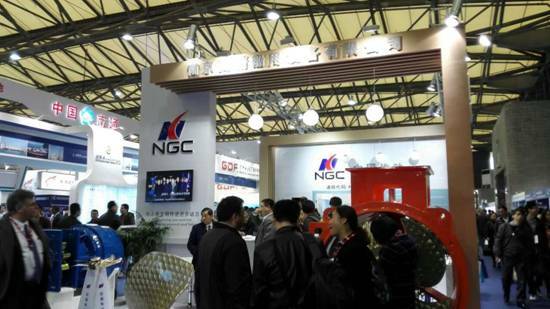 As a high-quality domestic supplier of power transmission system for vessels, NGC Marine Group primarily presented propulsion and transmission system for vessels, side propellers, rudder propellers and self-elevating platform lifting gear boxes amongst other projects, each of which received significant attention. This was especially true of the rudder propeller products, which attracted a vast number of staff from shipyards and design companies for inquiry at the booth. Some internationally renowned companies also attended to see our technical level and production capacities as well as to offer their praise for the rapid development and achievement made by NGC Marine Group in recent years. Rudder propellers are widely applied to special vessels and maritime works due to their fine operability and others, including semi-submerged maritime platform, self-propulsion lift platform, wind power service vessels, semi-submerged cargo ships, semi-submerged floating cranes, expedition vessels, exploration ships, lifting pipe-laying ships and tugs at port, and other facilities. In recent years, NGC Marine Group has independently researched, developed and completed the design and trial-manufacturing of the NRP series of rudder products. Hundreds of products have been successfully delivered for practical use with maximum single steering power of 6000HP. Many patents have likewise been obtained for products, with performance leading the domestic industry. NGC products have been replacing foreign brands in some major products in some countries and are now exported to overseas markets. The 10 ��42T Series Towing-Tension Full Rotation Tugs�� and 20 other sets of rudder propeller systems manufactured by the company have been listed under ABS classifications in the United States and are now being delivered. They will be ultimately exported overseas.